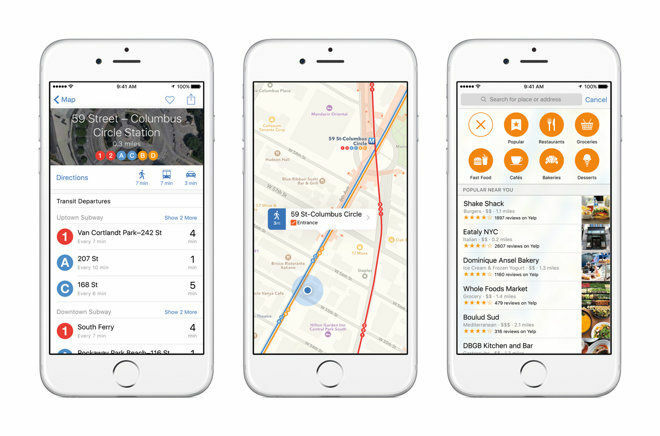 A year ago, Apple launched Transit directions in iOS 9 Maps, but so far there's only a limited number of cities worldwide that support the new feature. Here's why. Apple currently lists 19 cities (and "China") among its feature availability page for Transit Maps. Fifteen of those cities are in North America. Given that Maps' transit directions were built upon acquisitions including HopStop and Embark, users might be left wondering why Apple still supports fewer cities than HopStop once did, and why new cities are coming online relatively slowly. The answer has to do with the level of work involved, combined with a close attention to detail that's involved prior to launching transit directions in a new city. Ellis Verosub, Apple's senior manager of Maps Transit, outlined the work going into bringing transit directions to new cities at the company's June Worldwide Developers Conference. He noted Apple currently supports 21 cities, plus another 300 cities in China. Many of these "supported cities" are actually metropolitan areas that include several significant other cities. For example, San Francisco includes transit directions 90 miles south to Monterey and Salinas, 65 miles north to Santa Rosa, 80 miles east to Stockton, and includes all of San Jose (technically a larger city than San Francisco) and Silicon Valley, as well as Oakland and the East Bay area. 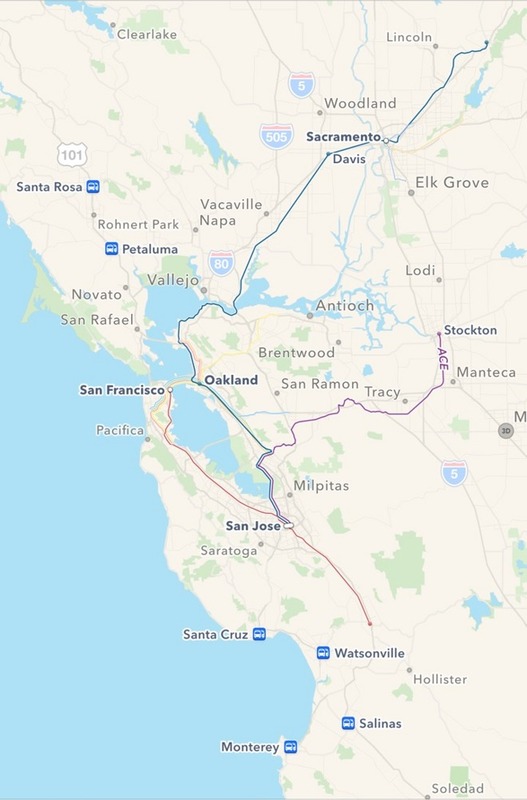 Train schedules from the Greater Bay Area reach all the way to and slightly past Sacramento (the state capital 90 miles east), although that city is removed enough to be counted by Apple as being a separate transit city. Each of these areas involve not just adjacent cities and suburban areas, but a massive network of different, overlapping transit agencies. Verosub noted that Apple currently gets data from over 250 transit agencies, and its station data maps over 16,000 station entrances across supported cities. 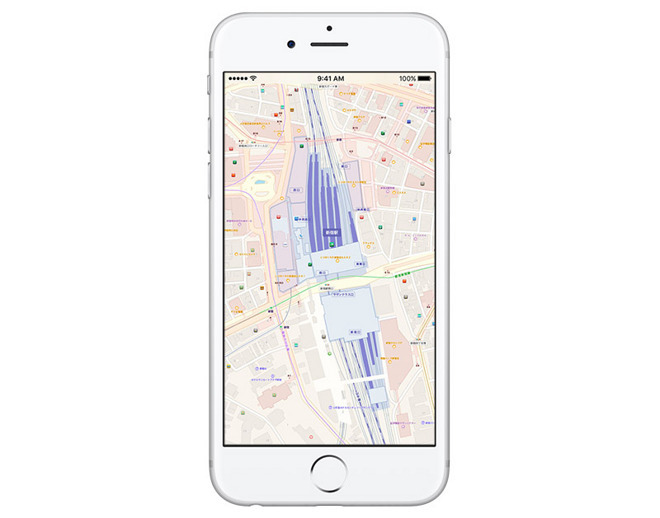 Rather than just making some transit data available within Maps, Apple has crafted a transit-specific map that includes route lines of subways and streetcars, detailed station maps with labeled entrances, and includes real-time transit advisory information from agencies included in a given route. Stops and stations in supported cities show each transit line that services that location, along with providing upcoming arrival information (below). Users can also select a line on the map and view that isolated route on the map to clarify where it goes. 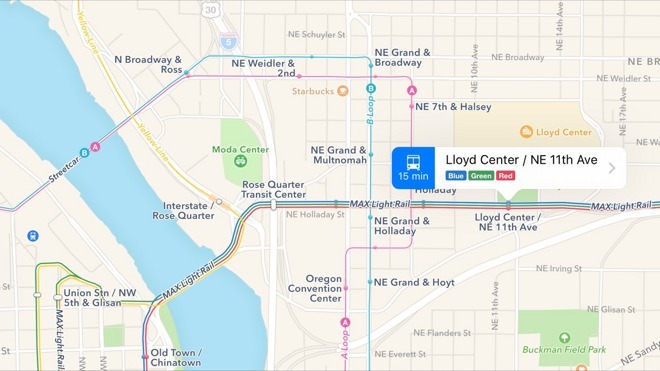 Apple's Maps team pays particular attention to local conventions, mapping transit lines and bus routes using the same signage riders will see, and using the vehicle descriptions and line designations native to each location. For example, in San Francisco riders take "a Bart train" or board a Muni Metro, bus or streetcar (not to be confused with the city's tourist-attraction Cable Car, which is also both named and signed as riders would expect). Each type of service has custom station markers reflecting the appropriate signage of the agency that runs it. However, in Berlin a rider would be told to board a Tram rather than a "streetcar," or the U-Bahn versus the "Metro." In London riders are told to board a given Underground "line" rather a "train," while in New York City, a subway line is conversely referred to a given "train," all due to local conventions. Route directions also use local naming conventions with regard to direction. In New York City, trains might be headed "uptown or downtown," while in San Francisco the Muni Metro lines run "inbound or outbound." The incremental rollout of transit cities in Maps is progressing in a markedly different fashion than Maps itself was launched back in iOS 6. Apple received significant blowback from users due to the fact that some parts of the globe had only minimal usable data for roads and points of interest, and that there were many visual errors and misplaced locations. 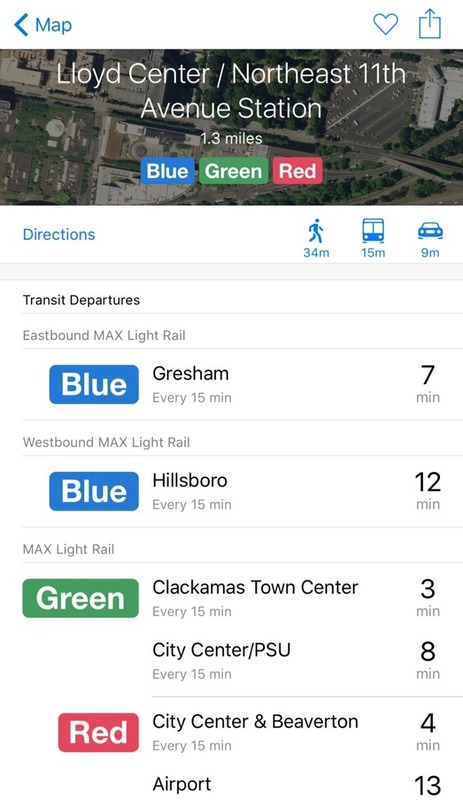 Apple's transit city launches also differ from the rollout of Google Maps, which rapidly expanded transit directions to new cities with incomplete or often simply wrong data. In Berlin, we earlier noted that Google only provided directions on a subset of the major lines--resulting in ridiculous path suggestions--while its arrival data for San Francisco was simply unreliable. 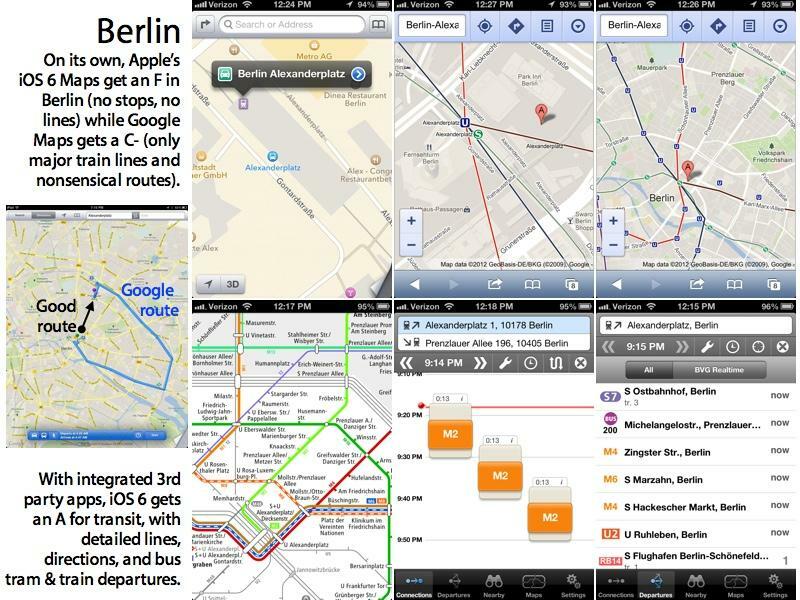 Apple initially relied on third party partners to provide transit routing from Maps, which helped the company to deliver better overall support for transit than Google's often provided (as depicted below back in 2012). As it builds out its own support for transit, Apple is now working to avoid more of the criticism it received earlier, while also avoiding the inaccuracy and unreliability seen in Google's frequently raw and incomplete transit data. That attention to detail is particularly important when it comes to transit, because if users get a first impression that the data is incorrect or unreliable, they're likely to not give the app a second chance. Delivering a polished transit experience requires a Maps development workflow that not only collects schedule data from transit agencies, but also involves original research and a local survey of specific transit details. Apple then curates an experience customized for each city before bringing its transit maps online. That includes underground station outlines with labeled entrances, agency specific signs (particularly important in cities where multiple transit agencies may serve the same station), and real-world paths of transit lines to orient the user along their path. Prior to Apple announcing its Transit support in iOS 9 Maps last year, AppleInsider noted that Apple's Maps were already indicating transit subway lines, at least to users located within mainland China. The data was (and is still not) available to users looking at Maps outside of the People's Republic of China, because it is derived from a different source, and licensed for use exclusively in China. Notably, Hong Kong--officially part of China--still lacks transit support from Apple Maps for users there and uses different Maps data. As predicted, Apple brought similar transit line and station data to a series of new cities in iOS 9. In North America, Apple has appeared to begin with transit data in some of the largest cities first, then has incrementally connected nearby cities to create a network of transit data. A similar pattern is emerging in Europe with London and Berlin (the only two areas currently supporting any transit directions there). Both cities now have national rail line information that covers a large area of the country. Berlin (shown below) includes rail routes stretching west to Hamburg and to Poznan, Poland to the east. 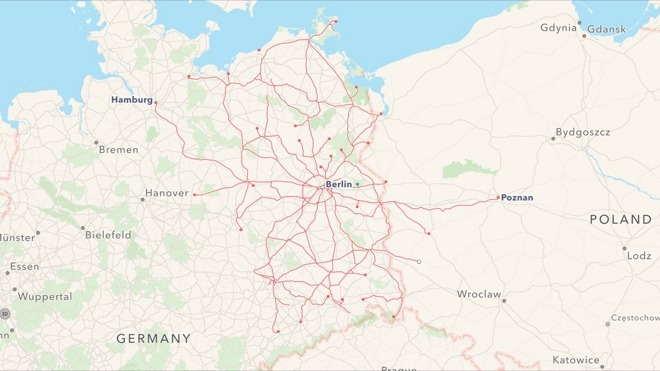 It might seem odd that Germany's Deutsche Bahn or Britain's National Rail haven't yet expanded across the entire country, but it appears that Apple's priority is to build support around cities where local transit is already complete, and then radiate lines outward to new supported cities as they come online. That's also the case in the U.S.A., where national Amtrak service routes are currently only supported between certain cities. So while Portland and Seattle now have local transit data, there's still no train data connecting the two cities. There is, however, fairly comprehensive information related to neighboring counties' bus services that go to Portland's train station. Apple could rapidly expand this intercity train data across the U.S. and Europe, and draft rough outlines of metro maps in more major cities, creating the illusion of greater coverage. However, Apple's approach of building out accurate and complete transit services for each city, and then incrementally connecting them together, builds confidence in its transit maps--at the expense of being a very slow process. However, there's reason to think the pace of adding new transit cities will continue to improve. Apple has noted on its corporate site in Japan that iOS 10 Maps will be introducing detailed transit support across Japan, a country that features expensive local transit services (including multiple networks of public and privately-run subway systems in Tokyo) and a comprehensive national high speed rail system. "Japanese public transportation is coming soon," Apple's Japanese site notes. "In Maps you will be able to search for transfer info and compare fares. Maps will show you all train line and station information above and below ground including connecting passageways at all major stations." The effort required to detail all of Japan's lines and complex stations with multiple platforms and dozens of entrances--including Tokyo's Shinjuku (above), the world's largest and busiest train station complex--has likely been consuming much of Apple's transit team's attention. Beyond China and Japan, Apple also has major customer bases in Taiwan and Hong Kong, both regions that make extensive use of transit and high speed rail connections. In addition to gaining experience and hitting a stride in the program required to build out transit support for new locations, Apple has outlined its plans to focus attention on new Maps features from a development center in India. 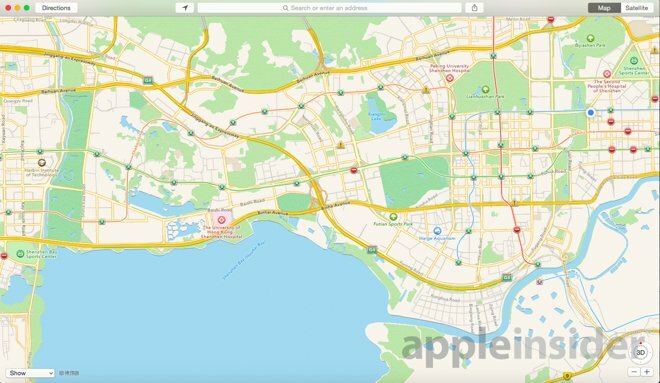 In May, Apple detailed the opening of an office in Hyderabad tasked with accelerating development of Maps products for iOS, Mac and Apple Watch. The office is expected to employ 4,000 workers and was estimated by outsiders to involve a $25 million investment by the company. "Apple is focused on making the best products and services in the world and we are thrilled to open this new office in Hyderabad which will focus on Maps development," stated Apple's chief executive Tim Cook at the time. "The talent here in the local area is incredible and we are looking forward to expanding our relationships and introducing more universities and partners to our platforms as we scale our operations."